UPDATED, April 9, 2011 — Néstor Rodríguez has been released from prison and has taken exile in Spain. Néstor Rodríguez Lobaina is one of the leading lights of the democratic opposition in Cuba, as evidenced by his more than 20 years of activism against the Castro dictatorship and by how his compatriots, on and off the island, have responded to his most recent arrest and imprisonment. Rodríguez, a co-founder with his brother of the Cuban Youth Movement for Democracy, was beaten, pepper-sprayed and arrested by Castroite thugs on Dec. 9, on the eve of International Human Rights, and imprisoned since then at the Combinado de Guantánamo prison. I want to denounce the situation that Néstor Rodríguez Lobaina is suffering at this moment in prison. His life is being threatened by convicts inside the same prison that the military police placed in Nestor's cell to beat on him. Yesterday while he was explaining, they would not let him speak on the telephone. The attending guard hung up the phone. He was telling him: "'Listen compadre, you cannot be saying that over the telephone." They didn't want him to say any of that over the phone, that these situations were resolved inside. They are doing this in an effort finish off Nestor. Other activists on the island have rallied in support of Rodríguez. Today, Thursday, Jan. 6, the leadership of the Orlando Zapata Tamayo National Front for Civic Resistance and Civil Disobedience called for Cubans on the island and in exile to mobilize to demand that the Castro regime release Rodríguez from prison, according to Cuban Democratic Directorate. And to show how serious they are, two activists — Eriberto Liranza Romero and Boris Rodríguez Jiménez — started hunger strikes to demand that Néstor Rodríguez be released, and warned the regime there would be other activities in support of Rodríguez. "We, activists of the Cuban Youth Movement for Democracy, will not stand idly by so much injustice and evil," the activists said in a statement. "We will start from Thursday a hunger strike ... and request the support of other brothers in the cause to demand the Castro regime immediately release our beloved leader and brother Néstor Rodríguez Lobaina. "'Not one inmate more! Free Néstor now!' Nestor Liberate Now ' is the slogan of the strike." Read an earlier profile of the Rodríguez brothers for more information about the Cuban Youth Movement for Democracy. Special kudos to Cuban Democratic Directorate and John Suarez for their efforts to spread the word about what is happening to Néstor Rodríguez. 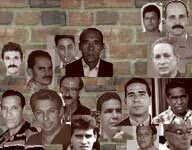 For more news and information about Cuban political prisoners and other events on the island, follow Uncommon Sense on Twitter @marcmasferrer.